More information about the choir and what we are up to. Milton Glee Choir is a fun and friendly group of over one hundred people who love to sing. We enjoy performing a wide range of music from Elvis to Verdi, Snow Patrol to Lloyd Webber and Elbow to Mozart - something for everyone to enjoy learning and singing. We are a four part harmony choir consisting of soprano, alto, tenor and bass singers The Choir was founded as the Milton Glee Club in 1948 by the late Stanley Mortimore who conducted the choir for its first 37 years. It began with a group of singers drawn mainly from St. James Church, Milton in Portsmouth, England and has grown to its present membership of 100 drawn from the greater Portsmouth area. Stanley Mortimore stayed with the choir, apart from a period of 3 years job relocation in Plymouth, until his untimely death in May 1986 and was instrumental in starting its link with the Bolinger Mannergesangverein Choir in Germany. An association which resulted in many trips, in both directions, performing in music festivals. Brian North was appointed as Musical Director in 1986, and continued to grow the choirs reputation and repertoire up until his retirement as Musical Director in December 2017. Under Brian’s guidance, the choir gave regular concerts at smaller locations for many charities such as Parkinsons UK and raising many thousands of pounds. Each Easter, they perform a Sacred work such as Vivaldi's 'Gloria', and Brahms 'Requiem', Handel's 'Messiah', Karl Jenkins 'The Armed Man' and gave a Portsmouth Première of William Lloyd Webber’s ‘Divine Compassion’. Over the years this now 100 strong, 4 part, choir has appeared regularly at the Portsmouth Guildhall and travelling further afield to Fairfield Hall in Croydon, the Royal Albert Hall , and the Festival Hall in London. They have had, as guests for their concerts, such stars as Rostal & Schaefer, David Hughes, Roy Castle, Tom O’Connor and Pam Ayers to name but a few. 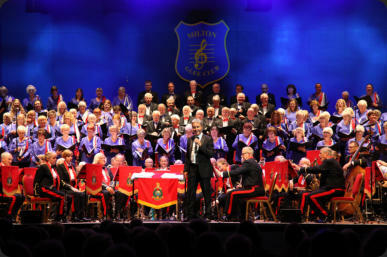 They have also had a very long relationship with the Royal Marines Bands and Orchestras. The choir especially values its relationship with the Royal Marines Association Concert Band, The Hampshire Police Band and the London Show Orchestra. The choir has had a busy few years recently as, in addition to regular concerts at Portsmouth Guildhall, it has performed at the huge stage on Southsea Common in front of 10,000 people as part of the D-Day commemoration and at a major concert evening in Chichester Cathedral. Recent highlights have been recording the Milton Glee Choir's contribution for the ‘Heroes Tide’ CD, supporting the D-Day Museum appeal, a joint concert with The Bath Chorus and being joined on stage by ‘BelCanto’, a choir from Germany. This involved meeting up once again with friends from many years ago for a wonderful weekend of friendship and music making. With your help we have raised over £130,000 for local charities over several decades. Thank you to anyone who has supported us at any event and look forward to seeing you in the future. You keep coming and we'll keep singing! In 2018 the choir celebrated it’s 70th Anniversary and also welcomed the arrival of their new Musical Director, Andrew Cleary. The choir has been through a bit of a re-vamp in 2019, with a new look outfit and a change of name and logo. Rest assured, however, that this is the same enthusiastic, friendly group of people who will continue to entertain everyone that attends one of our concerts. and what we are up to.